Objective Although previous studies have examined the impact of maternal depression on child overweight and obesity, little is known about the relationship in Latino families, who suffer from high risks of depression and obesity. We prospectively investigated the association between depressive symptoms in women with young children and child overweight and obesity (overweight/obesity) at age 7 years among Latino families. Methods Participants included 332 singletons with anthropometric measures obtained at 7 years from the Center for the Health Assessment of Mothers and Children of Salinas (CHAMACOS) study, a birth cohort study. 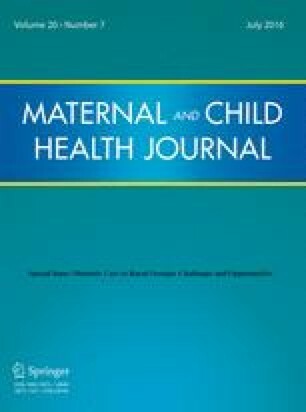 Maternal depression was assessed using the Center for Epidemiologic Studies-Depression (CES-D) scale when the children were 1, 3.5, and 7 years. Overweight and obesity was measured by body mass index (kg/m2) at age 7 years. Results 63 % of women had CES-D scores consistent with depression in at least one of the 3 given assessments. Compared to children whose mothers were never depressed, children whose mothers were depressed at all three assessments had 2.4 times the adjusted odds of overweight/obesity at age 7 years (95 % CI 1.1–5.6). However, a single positive maternal depression screen was not associated with child overweight/obesity and there was no difference in the odds of overweight/obesity by the age of the child when maternal depression occurred. Conclusion Chronic maternal depression during a child’s early life was associated with child overweight/obesity at 7 years. Addressing maternal depression is a critical component of comprehensive obesity prevention and treatment strategies for Latino children. Jocelyn Audelo and Katherine Kogut are jointly first author. The online version of this article (doi: 10.1007/s10995-016-1937-9) contains supplementary material, which is available to authorized users. This research was made possible by Grant Numbers R82670901, RD83171001, and RD83451301 from the U.S. Environmental Protection Agency (EPA) and PO1 ES009605 from the National Institute of Environmental Health Sciences (NIEHS). Its contents are solely the responsibility of the authors and do not necessarily represent the official views of the NIEHS or EPA. We gratefully acknowledge the CHAMACOS staff, students, community partners and the CHAMACOS participants and their families. Jocelyn Audelo, Conducted all literature reviews, analyzed initial data, drafted the manuscript and approved the final manuscript as submitted; Katherine Kogut, Conducted subsequent data analyses, reviewed and revised the manuscript and approved the final manuscript as submitted; Kim G. Harley, Assisted in conceptualization and designing the CHAMACOS study, oversaw data analysis strategy, reviewed and revised the manuscript, and approved the final manuscript as submitted; Lisa G. Rosas, Designed the tool used to assess risk factors for childhood obesity, supervised the use of these data, reviewed and revised the manuscript, and approved the final manuscript as submitted; Lauren Stein, Updated literature reviews, conducted subsequent data analyses, reviewed and revised the manuscript; Brenda Eskenazi, Conceptualized and designed the CHAMACOS study, supervised the data analysis strategy, reviewed and revised the manuscript, and approved the final manuscript as submitted. The authors have no financial or other conflicts of interest to disclose. Bickel, G., Nord, M., Price, C., Hamilton, W., & Cook, J. (2000). Measuring food security in the United States. United States Department of Agriculture, Food and Nutrition Service. http://www.fns.usda.gov/fsec/files/fsguide.pdf. CDC (Centers for Disease Control and Prevention). (2010). About BMI for children and teens. http://www.cdc.gov/healthyweight/assessing/bmi/childrens_BMI/about_childrens_BMI.html. Assessed February 2, 2015. U.S. Census Bureau.(2000). Poverty data—Poverty thresholds. http://www.census.gov/hhes/www/poverty/data/threshld/index.html. Accessed January 30, 2015. U.S.D.A. (2015). Economic research service. Food security in the United States: Measuring household food security. http://www.ers.usda.gov/topics/food-nutrition-assistance/food-security-in-the-us/measurement.aspx. Accessed February 2, 2015.